Length: 2 hrs. 46 min. If you answered “yes” to any of those questions, you might be rich. No, you probably don’t feel rich. Rich is the other guy. Rich is having more than you currently have. But you can be rich and not feel it. And that’s the problem. 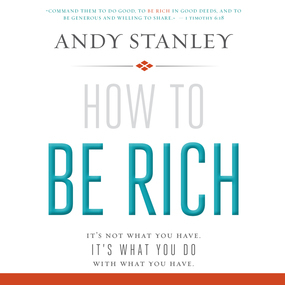 Andy is convinced that most of us are richer than we think. We just aren’t very good at it. It’s one thing to BE rich. Andy wants to help us all be GOOD at it!